Crocodilian training is becoming increasingly common in both zoos and private collections for a variety of reasons. Often times a training program is implemented with a single goal in mind. Stated training goals typically include increasing show quality, improving keeper safety or increasing animal activity. These goals can easily be measured as whether they succeed or not. Recent changes in feeding protocols at the St. Augustine Alligator Farm Zoological Park has revealed several unexpected additional benefits to even the simplest of training programs. By conditioning crocodilians to feed in a regimented manner, it is now possible to monitor the animals overall state. Body condition, temperament, appetite, dental condition, injuries, and total food consumption along with a variety of other aspects can now be closely monitored on a regular basis. The Alligator Farm has a long history of crocodilian training. Historically, this training was used as a means to entertain guests by having alligators perform “spectacular feats” during daily shows. In the middle part of the last century it was not uncommon to see alligators perform such stunts as climbing ladders, using slides, or being leash walked. Success was simply measured by the crowds’ reaction to the alligator’s performance of these tricks, and the thought that these animals were actually being “trained” for behaviors was somehow overlooked. 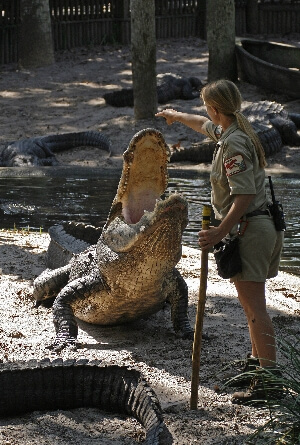 Over the past 10 years, the reptile staff at the Alligator Farm has taken a new approach to training. A gradual evolution of the keepers understanding of training led to continual policy shifts during this time. Keeper safety became the key focus for crocodilian training in the mid 1990’s, with an almost exclusive goal of shifting. In more recent years, stated training goals would typically include improving show quality, increasing animal activity, limiting aggression, and improving keeper safety. Each goal could be singularly defined and success would be easily measured. Although training continued to be an integral part of the Alligator Farm’s crocodilian management plan, several factors limited the potential for collection wide training. The crocodilian collection contains close to one thousand individual specimens housed in 80 different enclosures. A staff of four keepers maintained this collection, as well as presented daily shows and attended to the two hundred thousand guests that visited the park each year. Time was simply not available for large-scale training. In early 2005 The Alligator Farm moved from whole prey items, specifically Nutria, to a prepared pelleted diet. The introduction of this pellet significantly reduced the overall prep and cleanup time required for preparing croc diets. It also presented the staff with the new challenge of switching the crocodilians over to an unfamiliar and somewhat unnatural diet. To meet this challenge a new training program was established. The sole objective was to station train each animal so that food intake could be monitored. The protocol was for the keeper to enter the enclosure, kneel down at the pools edge, and have the crocodilians station at the water line (fig 1). While setting this goal and measuring its progress in a defined manner was important, it also limited a full understanding of the potential benefits of crocodilian training, a revelation became evident shortly after the new program was initiated. As a result of this new understanding, many additional benefits to this simplest of training techniques quickly became apparent. These incidental benefits manifested themselves throughout the facility in a variety of situations. Enclosures housing multiple specimens perhaps benefited the most as a result. Aggressive interactions between individuals decreased almost immediately after the station training was begun. Eventually, this allowed subordinate animals within the group to station as desired without risk of injury from cage mates. As a result, animals that were routinely injured or often appeared emaciated soon recovered, appearing healthy and alert within a few months. It also appeared to lower aggressive behavior during non-feeding interactions. This in turn helped to lower the stress level of an enclosure, allowing for more natural and preferred behaviors. These natural behaviors may lead to greater reproductive success within these groups. Any animals that were unable to adapt or compete within the group became easy to identify and special attention could be given without interference from cage-mates. One of the greatest benefits to station training in these group enclosures was the ability to learn the habits and condition of the individual animals. This allowed for quicker detection of any potential issues. Benefits were not limited to group enclosures, several lone specimens provided interesting results as well. The most important of which could be the reduction of fear of, or aggression towards, keeper staff. Specimens that would often go “off feed” if startled, or would sink to the bottom of the pool as soon as one entered the enclosure, soon learned to tolerate the presence of a keeper. This acceptance was not limited to feeding times. Once wary animals soon tolerated routine enclosure maintenance along with other intrusions. This gave keepers the freedom to service enclosures on a more frequent basis without concern of negatively impacting the animal. Similarly, individuals that were considered to dangerous or aggressive to enter their enclosure without first shifting demonstrated an encouraging change in behavior. By taking gradual, progressive steps towards stationing some of the more aggressive animals, keepers were soon able to routine enclosure maintenance. Animals that had a well-deserved reputation for lunging and charging soon sat idly as routine tasks such as skimming pools or clearing drains were performed. Positioning keeper staff in close proximity to crocodilians during feeding allowed the staff to learn the individual feeding habits of each animal. This allowed for quicker training, less food waste, and increased ability to monitor the animals body mass. One of the most rewarding benefits to this practice was a greater understanding of each species abilities. Range of motion, preferred food placement, and visual acuity all had slight variations by species. Learning these differences gave a better understanding of the individual needs of a species. This feeding technique also provided an opportunity for visual inspection of animals. It became possible to inspect for injuries or infection on a regular basis without the need to physically restrain the specimen. Regions of the body such as the gular, palate, teeth, and eyes were easily seen (pictured below). Several incidental benefits to the new training program went beyond individual specimens or enclosures, proving to serve the facility as a whole. By focusing attention on each animal in every enclosure, the crocodilian collection started to be managed as individuals and no longer as a herd. Keepers began to pay attention to smaller details and minute changes in behavior. Noticing these differences increased the chances of avoiding problems within collection. Potential medical concerns were caught sooner and the long-term health of the collection was improved. Lower stress levels within groups and increased food intake by subordinate animals provided resulted in healthier crocodilians with improved body condition and less visible injuries. This greatly improved the display quality of several enclosures, thereby raising guest perception and satisfaction. 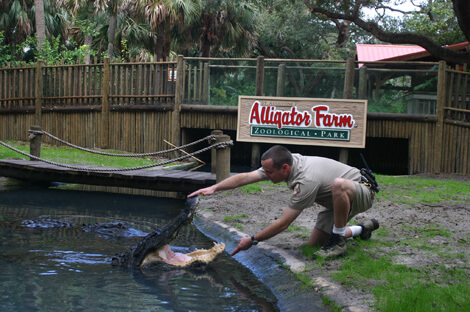 One of the greatest benefits witnessed at the St. Augustine Alligator Farm as a result of station training may be seen with our Tomistoma pair. It’s not a stretch to believe that the increased courtship and breeding behavior of the Tomistoma were a result of station training. By reducing aggression during feeding, the female became comfortable with both her surroundings and the advances from the male. This reduction in stress is believed to be a major factor leading to her first time nesting behavior and subsequent egg laying. Setting goals and laying out protocols is a vital part of training. However, being focused on these goals can sometimes limit ones understanding of the true potential of crocodilian training. Often times the simplest of training techniques can have unexpected benefits. It is important to remain open these benefits that may occur outside the original parameters, and not be limited by original goals. Basic methods of training can benefit the collection and the staff, as well as, the facility. You don’t always need a reason to train, make the time, and good things are bound to follow.